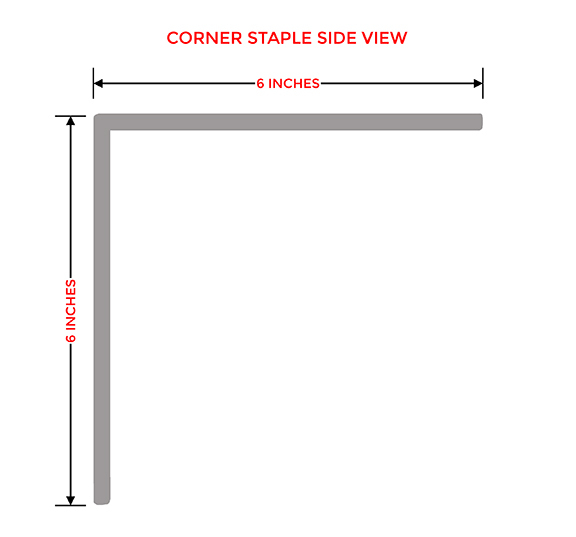 NOTE: Take a look at your Corner/Radius Staple. There are 4 holes. 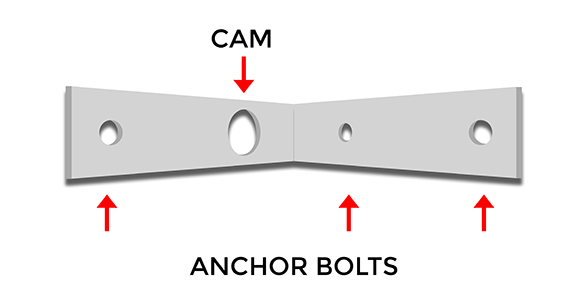 The three smaller sized holes are for anchor bolts, and the single larger hole is for the CAM. Using the template provided in your Torque Lock Radius/Corner Staple Kit, trace around the outside of the template and mark cutouts along the crack approximately every 12 inches. It may help to pre-fold the staple at the center line as marked on the template. 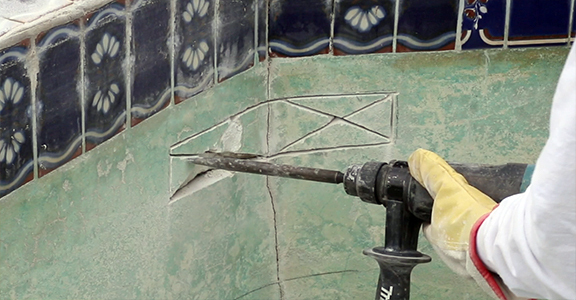 Using a masonry saw with a 4 ½” Diamond Blade, make a plunge cut into structure along the marked lines, approximately 2 inches deep. Then, ‘V’ open cracks between cut-outs to aid in chipping out the area. (see demonstration video for best practices). 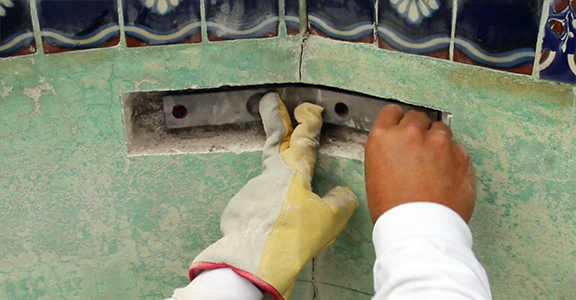 Using a small hammer drill (recommended), chip out the debris and clean the recessed area where the staple will be inserted. Center and hold the corner/radius staple in the cut out area. Use a pencil or wax crayon to trace and mark drilling locations in the small holes of the staple, indicating where you will drill for the anchor bolts on either side of the crack. 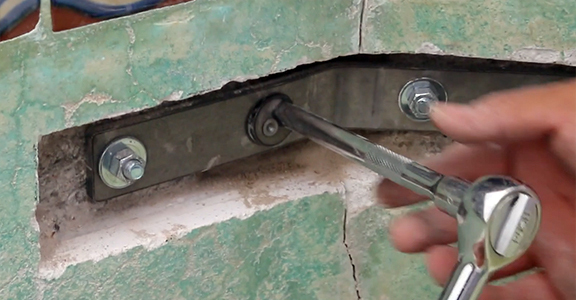 Clean out the drilled hole and tap your first anchor bolt into the drilled hole. 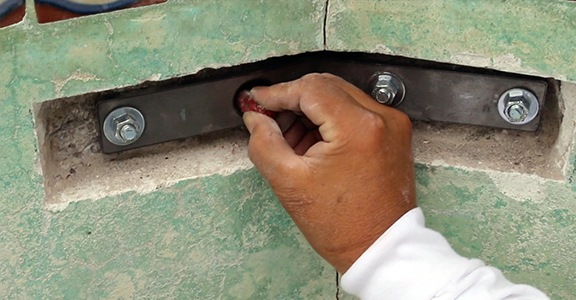 Install the corner/radius staple over that anchor bolt and using a ratchet, secure the staple flat to the surface with a washer and hexnut. The staple should be now be held into the wall. Drill through the two other small holes of the staple (right side as seen in demonstration video) where you previously marked them. Do not drill out the large hole for the CAM yet! 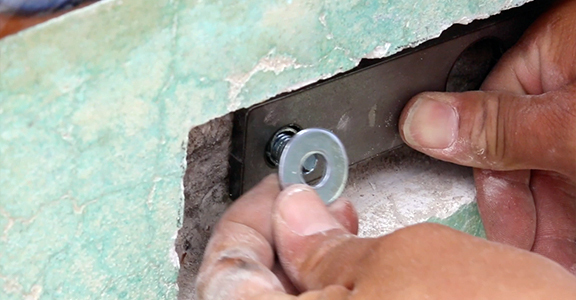 Clean the drilled holes and insert two additional anchor bolts with washers and hexnuts, using the ratchet to secure them and flattening the staple to the wall. 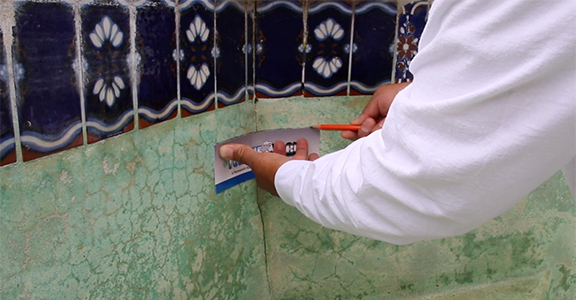 Your staple should now be tightly secured (see demonstration video). Line up the CAM in the larger hole, recommended to have the square “ratchet hole” positioned nearest to the crack, and mark the location of the post on the structure.NOTE: The post marking should be off center. 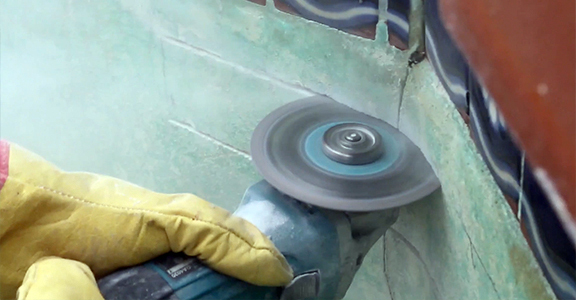 Drill through your marking and clean out drilled hole. If the hole doesn’t line up properly, you can use the next size up (or larger) drill bit to enlarge the previously drilled hole. Then use the supplied epoxy to securely set the post into the hole. Set your torque wrench to 22 lbs. 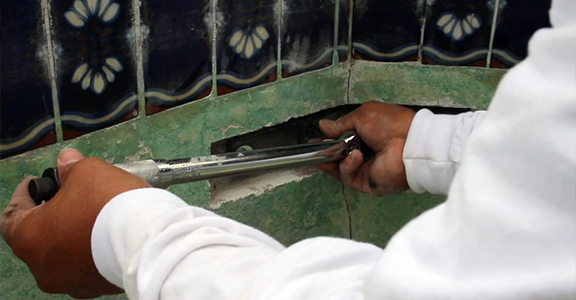 Using 3/8th inch ratchet attachment, tighten in either direction until the torque pounds is reached. 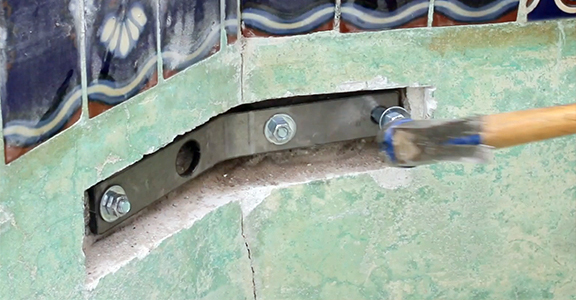 *PLEASE NOTE: If installing Torque Lock Staples in either a gunite or shotcrete application, it is recommended to achieve 22 lbs of torque on the corner and radius staples. 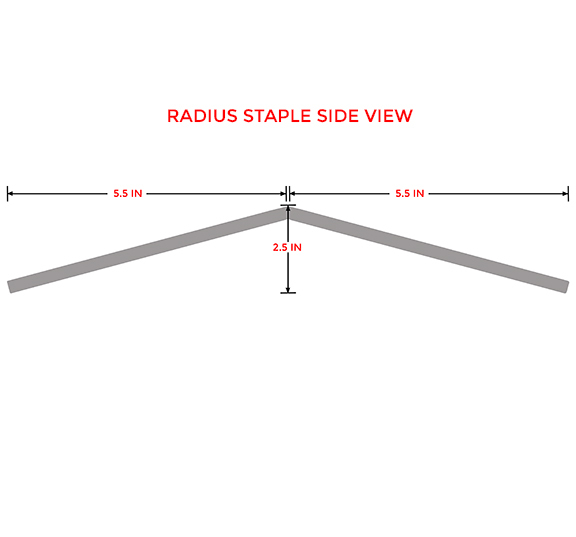 *HOWEVER: If a structural crack has another crack within a 5 foot distance, the corner and radius staples should be torqued at 12 lbs. Although these instructions are intensive, it is highly recommended that you watch the accompanying installation/demonstration video below.